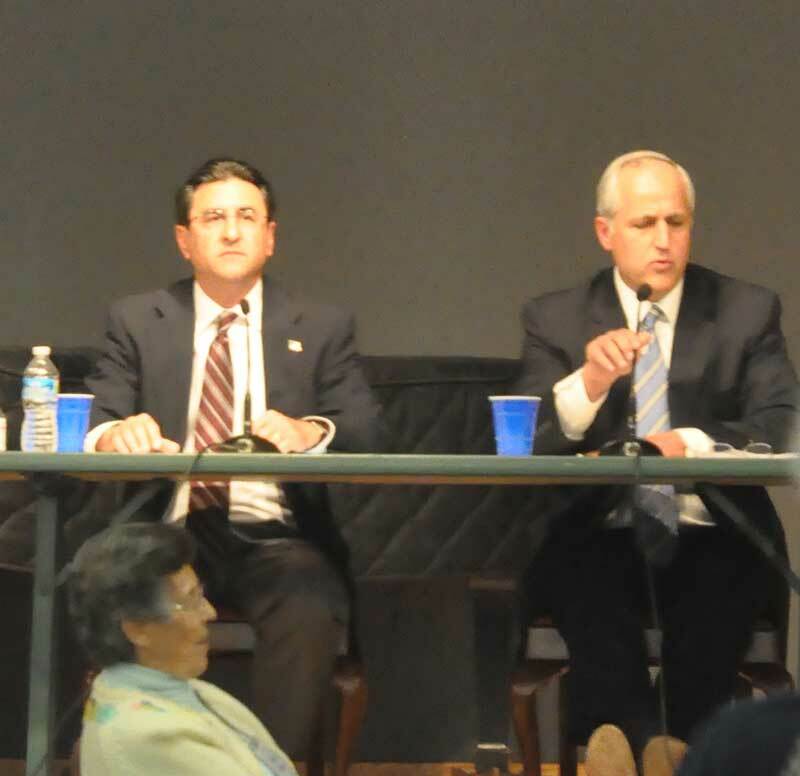 Roger Howard (left) and state Sen. Dominic Pileggi traded barbs — and showed vastly differing visions for Pennsylvania during a League of Women Voters forum Thursday night. PENNSBURY — In more than an hour of sometimes testy exchanges, the two Republican candidates for state Senate from the 9th District showed very different visions both in terms of the reality of governing as well as philosophy, during a League of Women Voters forum Thursday night. State Sen. Dominic Pileggi (R-9), facing a primary challenge from Roger Howard of East Marlborough, spent much of the evening trading barbs with his opponent in front of a packed room at Crosslands, estimated to be well over 200 people. Howard, who enjoys support from local Tea Party groups, argued for less government, lowering state debt and ending government subsidies to business and special interests, while Pileggi, who also serves as Majority Leader of the state Senate, argued his opponent’s positions amounted to “great sound bites” but lacked the reality required for governing the commonwealth. Both candidates answered questions from the audience on topics from pensions to property taxes. Right from the start, Howard was on the attack, calling Pileggi “one of the major obstacles to reform” in Harrisburg, despite voters having sent an all GOP legislature to work with a new GOP governor, Tom Corbett in 2010. He also criticized Pileggi for spending on corporations that give money to the senator and other Harrisburg power players, and a series of scandals by Republicans and Democrats charged with using legislative staff for campaign purposes. Pileggi, battling laryngitis, aggressively defended his record, citing his battle to curtail spending under former Gov. Ed Rendell. “Pennsylvania was going to become another California, if we didn’t step in,” he said, referring to himself and other Republican leaders in Harrisburg. Howard countered that he questioned Pileggi’s claim at fiscal conservancy, with the commonwealth increasing spending from $41 billion in 2002 when he took office to nearly $61 billion — numbers he says have been hidden by borrowing money to pay for maintenance projects, he said. Pileggi defended the current budget, saying cuts had been made and that likely budget coming out of Harrisburg this June would again be lower than the year before, for the second straight year and again would feature lowered franchise taxes and no tax increases. He added that reductions can’t just be made to the budget in a random fashion, but have to be done in a “disciplined” way. On jobs, while both agreed that the state needs to improve the climate for business — including cutting the corporate tax — the two differed on what the state needs to do to compete with other states and foreign countries. While Howard opposes tax breaks and subsidies for business, Pileggi argued that neighboring states and even other countries won’t hesitate to offer perks to bring in industries and jobs. Without them, he said, Pennsylvania will be left on the outside looking in. “We need to be able to take advantage of our assets,” Pileggi said. On the issue of state pensions — including teacher pensions, which have become an increasing financial burden for local school districts — Pileggi said some reform had already been accomplished, but much more work was to be done, including moving state employees from “defined benefit” plans to “defined contribution” plans similar to 401K retirement plans. “We’re out of step with the private sector,” he said. He said he expected the legislature to take up the issue this fall. The two also crossed swords on the issues of sprawl and redevelopment. Howard argued that it should be left in the hands of the private sector and that government should stay out of it. Pileggi suggested that stance reflected a naive view. The two offered starkly different views about working with Democrats — who while currently in the minority in the legislature have been needed to pass various bills in the last couple of years. While Howard said he felt he could work with Democrats if “they are above board about where their objectives are” he said that it was important for an elected official to never give up their principles, suggesting that he would find much of what he felt the Democrats support in variance with his beliefs. “I don’t think I could work in concert with standard Democrat principles,” Howard said. On property taxes, the pair again showed a great difference in opinion. Howard called for the end of the Act 1 legislation and a new laws requiring a public referendum for any school district to raise taxes. He also expressed support for House Bill 1776, which would increase the state sales tax to pay for schools and eliminate property taxes. Pileggi said that local property taxes amount to about $13 billion — nearly half as much as the current state budget, a number he said a small sales tax increase could never replace. What he thought was more realistic was program for senior citizen property tax relief, a program estimated to cost between $2 billion and $4 billion, he said. While he acknowledged that finding even that much money would be difficult, he said he thought it would be achievable in the near term. Is it conservative to vote for your own pay raise? Is it conservative to receive the endorsements and millions of dollars from labor unions? Is it conservative to vote for 7 Rendell bloated budgets? His suggestion for property tax “relief” for seniors is just another Band-Aid on a hemorrhage. Senator Pileggi is sadly out of touch with the depth of the property tax problem, its solution, and the demands of Pennsylvanians. If he cannot be open-minded enough to consider such a worthy and effective plan as HB 1776/SB 1400 he does not deserve to be re-elected, especially since he alone, through his outsized influence, can kill the legislation. Details of the Property Tax Independence Act are at http://www.ptcc.us. The 2 political parties in Harrisburg are not Democrat/Republican, they are the Union party and the Taxpayer party. Pileggi is clearly the leader and representative of the Union party, and as the Senate Majority Leader, the gate-keeper of the Harrisburg Favor-Factory. Roger Howard will represent the Taxpayer. He will follow the PA Constitution and represent what can be right and good about limited, affordable government. Ray, May I quote you on that? Sarah- you are the one that is out of touch to suggest that Dominic Pileggi should run on the democrat ballot. That is absurd. He has a strong conservative record. You should be ashamed of yourself. Any intellectually honest person attending that debate last night would have to admit that Howard won it, hands down. Pileggi got called out on his union ties, wasteful spending and lack of firm leadership on a host of problems that have not been addressed—especially since the Republicans have owned all branches of state government the past two years. All Pileggi could do lat night was cough, gasp and grovel through his pat, mediocre “bipartisan answers— too afraid to have any spine or true convictions. He looked annoyed and bored and came unprepared to answer the charges against him brought by Roger Howard. It’s time to get someone in the state senate who is a Constitutional conservative who doesn’t owe anybody ANYTHING. I’m happily supporting Roger Howard next Tuesday and I’ll bring as many like-minded voters also to the polls. For the sake of all of PA, I hope Roger Howard wins Tuesdays primary and the 9th Senatorial District Seat in November! As citizens of the State of PA, with the highest business taxes IN THE WORLD, we cannot afford another term with a Senate Majority Leader that won’t vehemently address reform for the Keystone State! As a small business owner, I am tired of hearing “it is just not going to happen”, “it is not realistic” and “these types of reforms take time” as expressed repeatedly by incumbent, Senator Pileggi. Our PA business owners need realistic reform in PA NOW! I am going to vote for Roger Howard, our hope for a better climate in PA and our hope for our children’s futures. Amazed at the cynical, discouraging and downright hopeless attitude of Senator Pileggi! He seems to think that the thought of reform in any area is pathetic. His condescending remarks about Roger Howard’s, “applause points” were both unprofessional and indicative of the need for change! We cannot continue with a Senate Majority Leader in PA that thinks anything important to the citizens is “just not going to happen”. Roger Howard is willing to TRY to make a difference in PA and my vote is for him! I for one am not willing to throw up my hands and give up on turning our state around even if Senator Pileggi has already done so! Roger Howard was like a breath of fresh air last night at the debate. I had to chuckle when Pileggi said he has a good record working with those across the aisle; I imagine he does. Pileggi should be running on the Democrat ballot from what I’ve seen of his record. He has done very little on major issues for the taxpayers of Pennsylvania, except give lots of our money to billionnaires and union supported issues. I’m so very, very tired on hearing the same old rhetoric and that’s exactly what Pileggi gave last night. Roger Howard will have my vote on April 24. Sarah: You touched on the very reason that troubled me the most about Mr. Howard. One can always disagree with another. In politics, that is expected and sometimes differing opinions lead to compromises that actually are better in the end vs. one side or the other “winning” while the other is forced to “lose.” Mr. Howard clearly believes that Democrats are not “above board” in their objectives. That kind of attitude gets you to nothing except tax money wasted arguing and gridlock. You may disagree with a Democrat or, I with a Republican, but I do not accuse them of being dishonest or deliberately misrepresenting themselves or their objectives. We do not need sandbox level fights in the Pennsylvania legislature. We need solutions, ideas and compromise, particularly in the tough times. We need that on both sides. Mr. Pileggi does seem to understand more about how the people’s business should be conducted. We finally have a choice, YEAH! a common sense fiscal & constitutional conservative in Roger Howard, who will truly represent the taxpayer and lead the effort in Harrisburg to live within our means..
Roger Howard was the clear winner of this debate. I give Roger Howard an “A” grade and Pileggi a C-. “Rendell’s Republican” has finally met his match in this tough, former 82nd Airborne paratrooper named Roger Howard. I attended the debate last nite, not sure what to expect. Roger Howard was the clear winner. He did not try to use talking points but was very clear on his vision for Pa. It was a breath of fresh air to see a candidate with convictions of the heart. We need more candidates not bought and paid for by special interest and less union owned senators like Pileggi. Congratulations to Howard for a job well done. You bring hope to the voters that their is still candidates with integrity and honesty people who want to serve their constituents. Roger Howard was knowledable and had great suggestions regarding campaign finance reforms. what was clear from the debate last night is that Howard is a out of touch, delusional, condescending and desperate candidate. I went there with an open mind and undecided on who i am going to vote for. Howard lost my vote. He was rude, and so were his supporters. who wants to vote for a guy like that. I am casting my vote for Pileggi and any intelligent individual should too. Foster Giles, with all due respect, it appears that you are OUT OF TOUCH. I was present at the debate last evening and folks were respectful and polite to eachother on both sides. Enough with the negativity and false claims. Howard was the clear winner of that debate against Pileggi who must have found that laryngitis was the least of his problems! Howard was prepared and clear on all of his talking points. Pileggi seemed unprepared and clearly reeling from the unexpected challenge. He appeared especially stunned that a member of his own GOP would hurl the number of insults that occurred or that the audience appeared to favor his opponent. He was left in the awkward position of having to explain that the job is harder than an overly simplistic applause line. I found a bit of humor in the idea that the highly effective Republican campaign tactic of ignoring reality by over-simplification in a 30 second clip was being used against another Republican. Then the horror of it all gripped me, one of these guys is going to be our new State Senator! It is unlikely that Patrica Worrell is going to be able to mount any kind of campaign on the Democrat side with no money. Pileggi has enough baggage to sink a barge from his days in Chester and the District is so ridiculously gerrymandered that trying to represent the interests of Unionville and Chester would be a challenge for anybody. Both of these guys want “libery” and Constitutional rights for MEN. They want small government until that government suddenly needs to get bigger to force a transvaginal ultrasound on any disparate woman contemplating an abortion or block her efforts to affordable contraception so she doesn’t have an unwanted pregnancy in the first place. The attitude of both of them is “burn baby burn” when it comes to the environment. Literally laughing at wind/solar alternatives and both promoting Marcelles shale for “cheap energy,” I began to see this debate as a sickening event to witness. Howard made a few good points such as the one about the size of the legislative staff, but it is only 2% of the cost of the PA budget so it is a cheap applause line, an accurate assessment and no real solution to any of our big problems. People need to work somewhere so if you get rid of them, they collect unemployment because jobs are too hard to find in PA and it adds to the huge deficit created in unemployment compensation. So even when Howard is right in the short term, he blows it in longer term ramifications. As a staunch Democrat who has worked hard against Pileggi in the past, I’d have to say that he is less scary than Howard who has no real grip on the real issues.